Modern readings of ancient Athenian drama tend to view it as a presentation of social or moral problems, as if ancient drama showed the same realism seen on the present-day stage. Such views are belied by the plays themselves, in which supremely violent actions occur in a legendary time and place distinct both from reality and from the ethics of ordinary life. 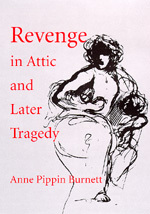 Offering fresh readings of Attic tragedy, Anne Pippin Burnett urges readers to peel away twentieth-century attitudes toward vengeance and reconsider the revenge tragedies of ancient Athens in their own context. After a consideration of how our view of Elizabethan drama has obscured an accurate view of the ancient tragedies, Burnett reviews early Greek notions of vengeance as expressed in the Odyssey, Heracles' tales, Pindar's odes, Attic judicial processes, and the legend of Harmodius and Aristogeiton. Then, setting aside post-Platonic and Judeo-Christian notions of criminality, she provides new interpretations of all the Attic tragedies in which revenge is a central theme: Aeschylus' Libation Bearers, Sophocles' Ajax, Electra, and Tereus, and Euripides' Children of Heracles, Hecuba, Medea, Electra, and Orestes. Burnett shows that for the ancients, revenge meant a redress of imbalances in both human and divine worlds, achieved through human actions. The vengeful heroines thus appear in a new light. Electra, Hecuba, Medea, and others cease to be the picture of depravity in dramas that are grotesque and sensational, and are instead representative human figures who respond with grandeur to the outsize demands of necessity and supernatural powers. Anne Pippin Burnett is Professor of Classics, Emerita, University of Chicago. Her previous books include Catastrophe Survived: Euripides' Plays of Mixed Reversal, Three Archaic Poets: Archilochus, Alcaeus, Sappho, and The Art of Bacchylides.